Lately I’ve been trying to ride my bike more often. I try riding to work daily. More often than not, I end up riding maybe twice a week. But I’m loving the ride. Lately, this joy for riding has taken me to night riding with the fellas. I hope we can do this regularly. Tonight (09/01/11) we rode in the middle of the night. Around 14 miles. We were so unsafe about it too. I was the only one with a helmet, we had no blinkering lights (I believe it’s illegal to ride without it at nights), we went on roads with no bike lanes. It was dangerous. But we loved it. I did however feel like the old(er) guy. I’m sure you can’t notice by the picture, but I’m the oldest one (far right, in black). I looked like a nerd. Helmet, reflector vest (not seen here), hiking backpack with a water hose. Ariel (he’s from Argentina) was the trendy one with the cool Fixed-Gear Bike. Jeff (he’s the buff one who looks like he belongs in Venice pumping iron) was chillin’ on his cruiser. Me, I was on that gorgeous mountain bike (birthday gift from Ekko a few years back. I think they were trying to hint something to me. I haven’t the foggiest idea what that could be). I can’t help but think how mismatched we looked. Most of the time when you see people riding together it’s a bunch of riders who look very similar, ride similar bikes, dressed in the same type of gear. They are crews that ride together. Or young bucks on their bmx’s jamming around their neighborhood. Or serious bikers blazing through busy streets often forgetting this is not France, and they are not in a Tour (de)! I’m scared for them. We, however, looked like three separate riders who happened to find each other and are now looking to find their way home together. Basically, we didn’t look like we belonged together. Only Jesus could have a crew, a team, a church, that has in it such a diverse group of individuals. We are nothing alike expect for one thing, our desire to follow Him. In the church we find that we are no longer bound to hang with the same kinds of people. We are free to enjoy all peoples. This is liberating isn’t it? We belong to a whole new system, a whole new culture. Here, we can ride with anyone. 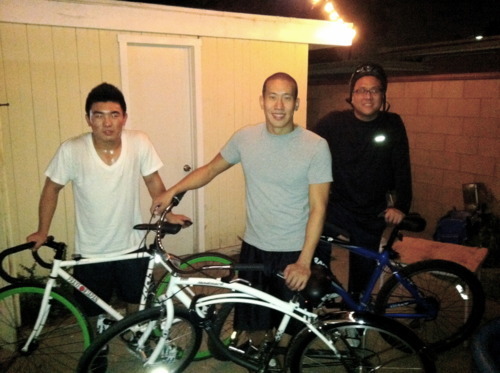 Here a Fixed Bike, a Cruiser, and a Mountain Bike can all ride in the night, reaching our destination… together.